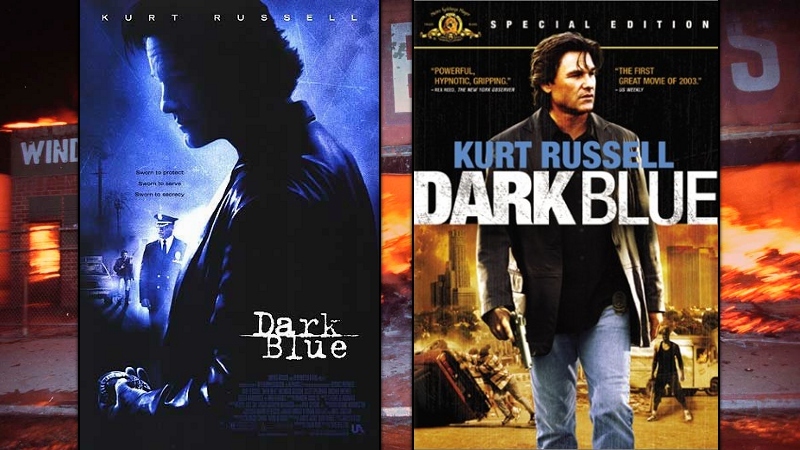 Ron Shelton's Dark Blue (2002) will forever be grouped with Antoine Fuqua's Training Day, which arrived one year earlier. Both were written by David Ayer, both revolve around crooked cops with reluctant young partners, and both take place within a short window as their environments spiral out of control. That's really where the similarities end...and no matter which one you rank as the better film, they both have their own set of merits and drawbacks. I've got a suspicion that Dark Blue has probably aged better and will continue to do so, even though the main reason it's still a relevant drama is due to the real-world events that seem to happen with more regularity each year. 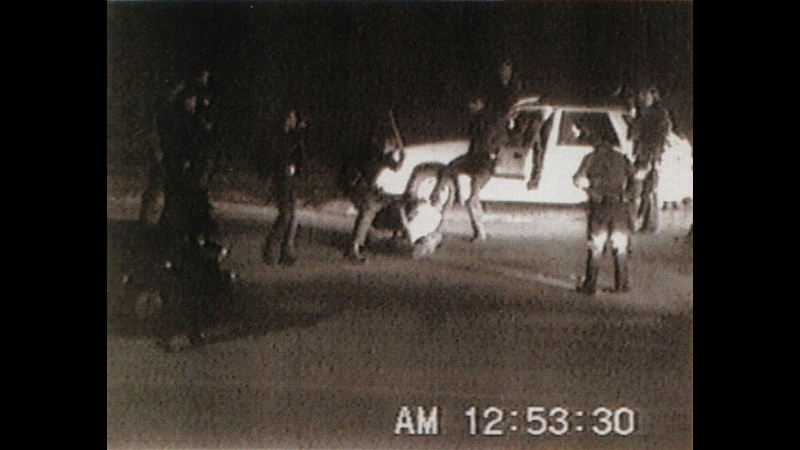 Our story follows Sergeant Eldon Perry (Kurt Russell) in Los Angeles, just days before the acquittal of fellow officers in the wake of Rodney King's 1991 beating. Perry is not the textbook example of a stand-up officer: he's racist, judgmental, and not afraid of bending rules to push his own agenda and "boy's club" politics. Reluctantly along for the ride is Detective Bobby Keough (Scott Speedman), a handsome young man who's obviously pegged to be the future Chief of Police according to Perry and his superiors, including Commander Jack Van Meter (Brendan Gleeson). The bulk of Dark Blue concerns the questionable actions of Perry, Van Meter and---to a lesser extent---Keough during the aftermath of a violent convenience store robbery by Darryl Orchard (Kurupt) and Gary Sidwell (Dash Mihok), as well as their friction with one of the film's heroic figures, Assistant Chief Arthur Holland (Ving Rhames). Holland's assistant Sergeant Beth Williamson (Michael Michele), who had an earlier fling with Keough before knowing his involvement with the case, is another beacon of light in what amounts to an endless sea of shady political dealings, corruption, and other moral roadblocks. Yet Dark Blue plays it smart by framing its small story in the shadow of a horrific period in Los Angeles' history, when the controversial verdict resulted in city-wide riots that killed 53, injured more than 2,000, led to more than 10,000 arrests, and caused more than $1 billion in total property damage. This "slow-burn" mentality gives Dark Blue time to breathe before the explosive final act, when Perry finally begins to question his actions and Keough forms an unlikely second partnership with Williamson. It's an ugly story that manages to go out on a hopeful note, thanks to the commitment of its lead and supporting performances. 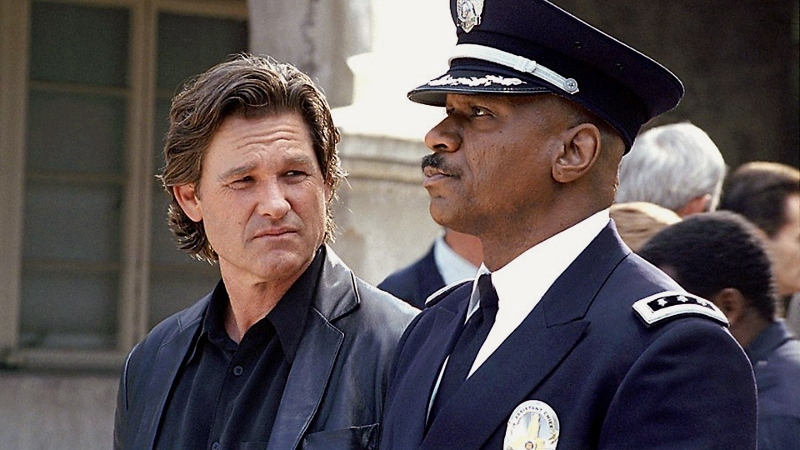 It's a minor miracle that director Ron Shelton managed to bring in the strong trio of Russell, Rhames, and Gleeson and maintain such a potent atmosphere despite the film's limited budget; luckily, the obvious short cuts don't show their seams very often. In fact, the only roadblocks are a few moments of ridiculous "street" dialogue that not even Russell and Kurupt can deliver convincingly. Denzel may have pulled it off a year earlier, but Dark Blue isn't as lucky. Nonetheless, it's a well-crafted film that holds up, although Dark Blue has yet to earn a definitive home video release. MGM's 2003 Special Edition DVD was a good effort, while the studio's 2009 Blu-ray dropped the extras in favor of a decent A/V upgrade. This new Blu-ray by Olive Films keeps the same technical specs and, oddly enough, only ports over a few of the original DVD extras; the result is a disc that should deliver more than it ultimately does. Presented again in its original 2.35:1 aspect ratio, Dark Blue looks identical to MGM's 2009 Blu-ray...which essentially means "good, but not great". Obviously, they're both better than the 2003 Special Edition DVD (a flipper disc, remember those? ), with decent image detail, occasionally strong textures, and not much in the way of dirt and debris. But there's an undoubtedly thin and not-quite-film-like appearance to this picture as a whole, which was common in earlier HD releases and usually the sign that a new master hadn't been struck. Either way, the film's consistently down-and-dirty subject matter doesn't exactly lend itself to glossy visuals, so I doubt many viewers will actually be disappointed with how this Blu-ray looks. But considering it's been six years since the last release (and Dark Blue most likely won't get another on this format), it's a shame there's still a fair amount of room for improvement. NOTE: The stills and images on this page are sourced from promotional outlets and do not represent the title under review. The DTS-HD Master Audio 5.1 track, while also identical to the previous release, sounds just fine to my ears. The action and music frequently spill into the rear channels, with strong separation and nice punchy low end on many occasions. Dialogue is clean and well-recorded with no drop-outs, distortions, or other such issues. My only problem with this release, however, is the lack of optional subtitles or captions, both of which were available in multiple languages (including English) on the previous DVD and Blu-ray editions. It's not surprising for an Olive release, but still frustrating when you consider it would have cost little to nothing to make sure they were included here. The main menu interface is clean and easy to navigate, with separate options for chapter selection and bonus features. Loading time is fast with no trailers or advertisements beforehand, aside from the Olive Films logo. This one-disc release is packaged with a studio insert and cover artwork much different than the promotional images below. Unlike MGM's 2009 barebones Blu-ray, Olive Films' new edition attempts to port over the extras from MGM's 2003 Special Edition DVD...but for unknown reasons, many of them didn't make the cut. The only items we get here are two "Internal Affairs" Featurettes: "Code Blue" (18 mins) and "By the Book" (7 mins), in which director Ron Shelton, screenwriter David Ayer, and other key participants discuss the film's production, development, social impact, and the infamous events surrounding its source material. They're both worth watching and I'm glad to see them carried over. Also here is Dark Blue's Theatrical Trailer (2 mins), which really doesn't capture the film's overall texture very well. Missing from the 2003 DVD is an audio commentary with Ron Shelton, a third featurette ("Necessary Force"), a photo gallery and a bonus segment included as an Easter egg. It's disappointing that these extras aren't included for whatever reason, which means that fans will probably want to hang onto those DVDs for a while. Dark Blue is a somewhat under-appreciated drama that, for obvious reasons, still rings true in light of current events. It's got a surprisingly good cast and atmosphere considering the meager budget, which aims for on-the-street realism instead of glossy action during its most effective moments. Yes, Training Day might get the win if you're forced to compare the two, but fans of the cast or genre should enjoy what Dark Blue brings to the table. Olive Films' Blu-ray is a confusing release, however: it offers an identical A/V presentation to MGM's 2009 barebones disc, yet more than half of the 2003 Special Edition DVD extras are missing in action. This virtually negates the need for a double-dip, but those who haven't purchased Dark Blue on Blu-ray yet may want to indulge. Mildly Recommended.